Public Bulgarian art is, for the most part, quite severe looking. The last five days we have been in Bulgaria, first in Sofia (the capital of the country) and now in a smaller city called Ruse (Rus-ah). After our long stretch in Greece (a little over 2 weeks), being in a new country feels strange. In Greece we had finally started to use some basic Greek words to communicate, and could recognize signage when we walked around, making it fairly easy to navigate. By the time we left Thessaloniki last week, I felt pretty comfortable with Greek culture and customs. Not so much in Bulgaria! 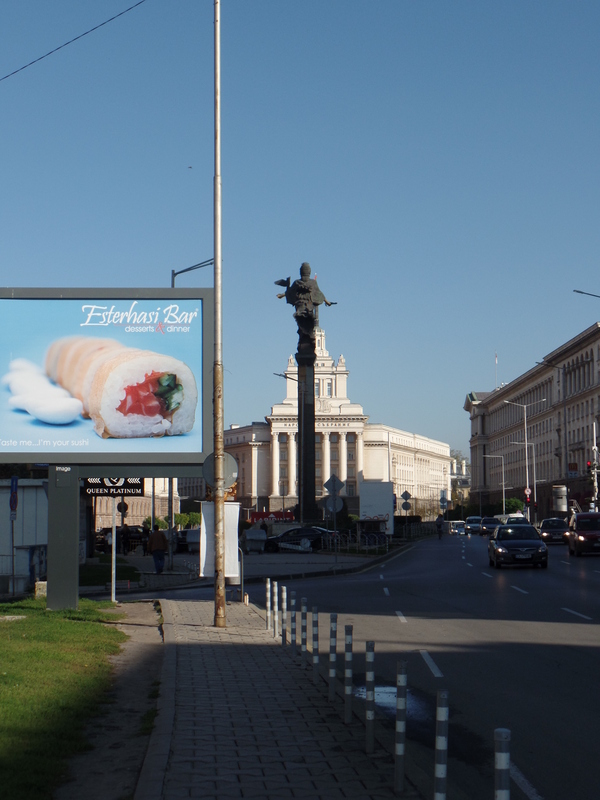 Both Sofia and Ruse feel much less tourist-oriented than either Greece and Turkey. We are also now clearly in the off-season for traveling in Bulgaria, as evidenced by the fact that several of the museums we have gone to have literally turned on the lights so we can see them. 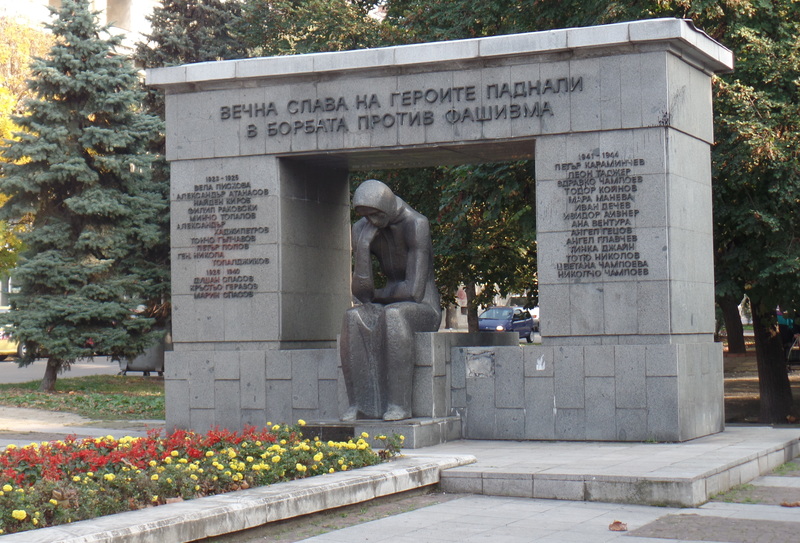 I had pretty much zero understanding of Bulgarian history and culture when we arrived in Sofia, and have to admit I did not expect it to be a very modern or sophisticated place. Statue in Sophia symbolizing freedom, and a sign advertising sushi. But as soon as we got to the central area of the city we were surrounded by high fashion shops, fancy cafes, modern buildings and truly gorgeous people. Sofia is a city of around 1.4 million people, and almost all of them are strikingly beautiful. In our funky NW travel attire we stuck out like sore thumbs. I almost decided to buy a fur coat at one of the many (many, many, many…) fur shops, but decided in the end not to get one since we were only there for three days and I hoped that Ruse would be less cosmopolitan (i.e., more laid back, man!). After reconciling myself to being “Rather Frumpy Erika” in “Highly Fashionable Sofia,” I jumped into exploring the many museums, cathedrals and monuments of the city. On the second day we were there, I went the the National Art Gallery and saw an incredible retrospective art show of a Bulgarian painter, Nikolay Nikov. During his life he rarely showed his work to others, so it was only after he died that his art was discovered by friends and family. The show had examples of his work from the time he was a very young boy through to when he died at age 65 in 1989. I am now rather obsessed with him and his artistic development, but can’t seem to find much about him on the Internet…sigh. 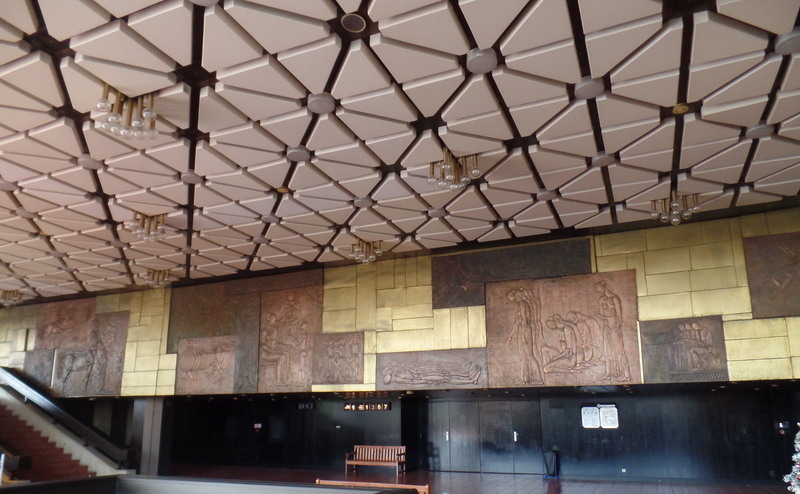 National Palace of Culture: Check out that ceiling! And the wall plaque! So cool! Thomas and I also enjoyed visiting the National Palace of Culture, which is a strange, very under-utilized convention and exposition center, and a bold example of Communist-era architecture. We were quite intrigued by the design of the building–especially the ceiling–and wandered aimlessly through the empty floors that sadly did not seem to be used for anything anymore. Our last day in Sofia included seeing the Aleksander Nevski Church and Crypt, watching the Changing of the Guard at the President’s Building, and eating lunch at Magernitsa, a restaurant that has a menu with 60 pages worth of traditional dishes gathered from monasteries around Bulgaria. Although we did not order it, we both though the menu item Embers Luckies Alighted on Gold Bread Slices sounded good, whatever it might be. After our weekend in Sofia, we took an early train from the Sofia train station (which we must note is part of the “Brutalist Architecture” movement) to Ruse. 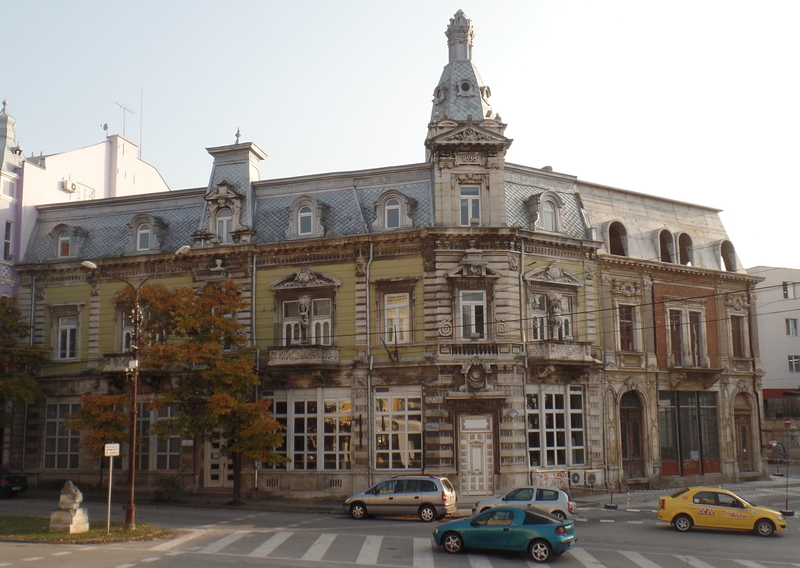 Ruse is about 6 hours north of Sofia and across the Danube River from Romania. I was relieved to find that Ruse is indeed a bit more low key than Sofia. Our time here has been spent visiting several monasteries and rural churches, as well as going to the history museum, the Pantheon of Revivalists and walking along the Ruse waterfront. We are staying about 2km from the city center and have greatly enjoyed walking into town through lovely tree-lined streets, wandering around the local marketplace and gawking at the ornate buildings that make Ruse the “Vienna on the Danube” (Lonely Planet). 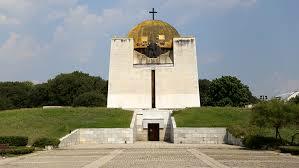 The Pantheon of Revivalists: A national ossuary of 453 activists of the Bulgarian National Revival. So, to wrap up this post, there are many elements of Bulgaria that I am enjoying, even if it has been a somewhat less easy place to travel in than Turkey and Greece. The countryside of Bulgaria is quite beautiful and lush–much more green and woodsy than Greece and Turkey were. And the weather here has been beautiful–bright clear days with temperatures in the 70s. Tomorrow we leave for Bucharest, Romania. I will do my best to write again soon!